It’s always inspiring to hear stories like the one I have to share with you today: It’s the story of a woman who learned to creatively meet a need other women were experiencing that she herself had at one time. And through that act of giving, she reaped the reward of her efforts through the establishment of a profitable business. Natalie Hoffman is a survivor of spiritual and relational abuse and has truly seen her ashes turn to beauty by walking her own path to healing — and then turning around to help other women coming along the path behind her. It’s an inspiring story and I’m so happy to be able to bring it to you. She’s a true victor and entrepreneur to be proud of. Is it even possible to turn a ministry into a business? And should you? In the specific niche Natalie targets — Christian women — it’s common for people to feel that it’s not right to charge people for help. After all, it’s a ministry. But Natalie realized that in her own journey, none of her healing came to her for free. She had to buy books, she had to seek professional help, she had to educate herself – and in every instance, she was paying someone, somewhere. That’s what led her to understand that asking people to pay for the help you offer is not a bad thing. In fact, it’s actually good because it requires them to invest in their own healing, which puts a level of accountability on the relationship and motivates them to take action. Natalie’s story will greatly encourage you if you’re hitting obstacles or opposition from people around you. You can find a way, and Natalie can help you do it. Be sure to listen. Find a need and meet it. 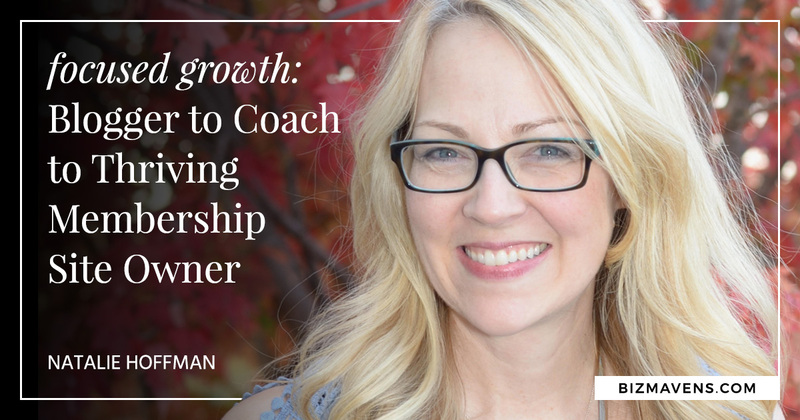 That’s what put her on the path to building a coaching business and eventually, a membership group that provides recurring monthly income for her. Listen carefully to how Natalie went about it. Notice how she educated herself, threw things against the wall to see if they stuck, and kept trying until she found what worked. It’s that kind of determination that goes into the making of any successful business. When Natalie felt she’d equipped herself just well enough to start helping other women, she decided to offer a very inexpensive coaching package for women: Six coaching sessions over three months. When she made it available, women started to respond. She wound up with six women, and the healing and freedom that happened in the lives of those women were amazing to watch. But she also realized that they were helping her at the same time. She was learning how to coach, how to run a business, and how to establish systems and create resources. And most of all – she chose not to let her low price point become a sticking point for her. In her eyes, she was making an investment in her own education and training through the experience. That was more valuable to her than official training or certifications could ever be. My hope for you is that you learn the powerful lesson Natalie did. What you don’t know doesn’t have to hold you back. You can do the same thing she did: meet a need. As you get your entrepreneurial plans rolling you’re going to hit obstacles. It’s unavoidable and is part of the price you pay for your own business education. After hearing Natalie’s inspiring story I wanted to know how she would counsel those of you listening who are in a tough or discouraging place right now. Her advice was simple but powerful. Instead of looking at the thing that’s discouraging you, remember the people you want to help, remember the needs you want to meet, and get your hands dirty meeting them. When you get reconnected with the benefits you offer to real people, you’ll begin to see that it’s worth the struggle. Don’t give up, just meet that need. www.KickstartYourConsulting.com – Get on the waiting list for my course! Wow! Another great podcast! Natalie – I LOVE your Oregon Trail wagon master analogy… and not just because I’m an Oregon girl… as I’m starting the journey to get serious with my blog, I’ve been struggling with owning my authority. I know people who need help, and connection. I know I’ve learned so much that I want to pass on! But I don’t have the expert initials behind my name. And THIS is it… the wagon master helping guide others to the resources, and over the road. And Jeni… your encouragement to just start and it’s okay to come back to refine is what the recovering perfectionist in me needs to hear. This was the most helpful podcast I have listened to is a long long time. So many gold nuggets for me. SO many! I feel empowered and encouraged to keep moving forward in spite of what I don’t know. What I don’t know holds me back all the time. BUT there’s a lot I DO know. Why not focus on that? Why not focus on my ability to learn new things? I am inspired. Wahoooo! It’s so freeing when you realize you don’t have to know everything to be helping people, Tammy. Cheering you on!